You are here: Home > What’s the Difference Between Moving Blankets? We offer nine different moving blankets as well as a thinner “moving skin” so choosing can be confusing. The fabric and the binding of a moving blanket is what determines whether it’s the very best quality or a limited usage blanket. 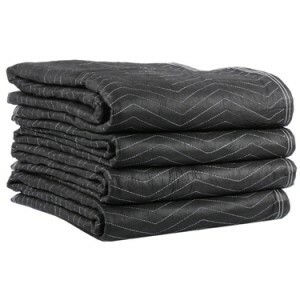 Choose one of our “Best” blankets if you need the best protection possible and intend to use the blanket repeatedly. The cotton and polyester blend fabric and woven polyester binding ensure it will last. Our “Better” blankets can also be used more than once, but the all-polyester fabric and non-woven binding provides less protection than those blankets with a mix of cotton. If you intend to use the blanket for just one or two moves, choose from our “Good” blankets. These have fabric and binding that are non-woven polyester so while not designed for multiple uses, they are more cost-efficient.